Timing and planning are everything when it comes to deciding when to eat prior to playing sports. Eating too much before a big game can leave you feeling tired or unmotivated. On the other hand, eating too little before playing sports can leave you feeling dizzy and weak. The decision of when to eat is largely based on your personal preferences. 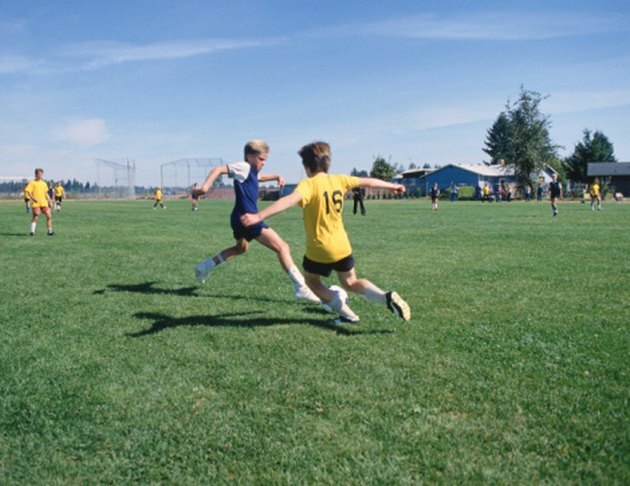 Eating prior to playing sports can increase your energy and provide you with vital nutrients and energy. Eat foods that are easily digestible -- including carbohydrates. However, eating too much right before sports may leave you feeling sick. If you are going to eat a big meal, allow four to six hours for your meal to be digested. Avoid foods that are difficult to digest -- including foods that are packed with fats and proteins. Sharon Howard of ESPN Training Room indicates you can eat a light snack prior to participating in sports. Snacks can take anywhere from half an hour to an hour to be fully digested. The digestion rate depends largely on the types of foods you consume. Howard recommends a snack packed with carbohydrates, which can provide you with energy without upsetting your stomach. The choice of whether or not to snack is going to be based largely on your own personal preferences. Some athletes enjoy a small snack, while others will avoid foods for hours prior to participation in a big game or meet. The best way to decide when you should eat before a game is to experiment with your eating schedule and practices for your sports team. Avoid experimenting before big games. Try eating a snack high in carbohydrates and decide if you feel more energized. Opt for a liquid snack -- such as a smoothie. Drinking liquids can help replenish your muscles, keep you hydrated and allow you to feel full before a game without having to eat a large meal. Consider the type of practice or game you will be participating in. For a light practice or workout, try eating a snack an hour beforehand. For an intense practice, workout or game, stop eating several hours before the event. ESPN Training Room recommends snacks that contain between 40 to 100 g of carbohydrates. These snacks should also be low in fat. Consider eating yogurt, muffins, sports bars, fresh fruits such as bananas, vegetable soups, milk, sports drinks or pretzels prior to athletic participation. Avoid consuming sugary drinks or food before and during sports; sugar will not give you energy and may result in a stomachache. If you need a boost during a sports game, try consuming a sports drink or small snack -- with 30 g of carbohydrates or less. Snacks and drinks should be spread out over 30-minute periods.